· Nearly 10,000 plumbers attended the Mahotsav by IPSC. The apex skilling body of the Indian Plumbing Industry, IPSC (Indian Plumbing Skills Council) organized the mega event, “Plumbing Skills Mahotsav” which was inaugurated by Shri Dharmendra Pradhan, Hon’ble Minister of Skill Development & Entrepreneurship at Thyagraj Stadium, New Delhi. The day long event was attended by almost 10,000 plumbers from all parts of North India who were trained in the latest plumbing techniques and were also handed out participation certificates. – World’s 1st Mobile App which aims to bring certified plumbers closer to its users. 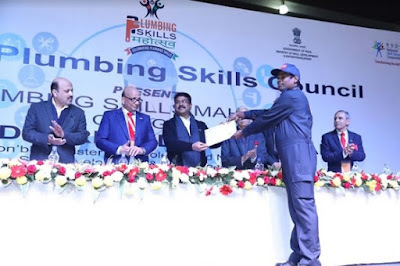 Plumbing Skills Mahotsav also witnessed the best plumbers being handpicked for International and Domestic placements by the companies as a part of the Job Fair. Other excitement at the mega event includes Lucky Draw including Motorcycles, TVs, Tool Kits, and Prizes etc.